Need your push/walk-behind mower or riding mower serviced for the season? Give me a call - a basic tune-up only costs around $45 (more or less depending on whether additional parts are required). Tune-ups include oil change, cleaning of air filter, checking fuel filter / spark plugs, and sharpening blades....and if the weather / temperature is decent a free pressure washing of your mower. CALL ME! Your convenience means a lot to me! This is why I offer on-site or in-shop repair of your lawncare equipment. That's right, I come to YOU. This includes lawn mowers, riding mowers, leafblowers, snowblowers, weed trimmers and edgers, and a variety of other garden equipment. Doing yard work on the weekend or after hours and your equipment breaks down? Call me and I'll come to you. I'll fix your equipment on-site (when and where possible). If your equipment is not able to be repaired on-site, I'll complete it at my shop and return it to you. Fixing the lawncare equipment yourself but can't get a part after hours? Call me! I am a Rotary Parts dealer. I can review my list of lawn & garden equipment parts with you and get you what you need to get the job done. Travel fee is $1.50/mi from our Carlisle shop location, with minimum charge of $15. Witmer Services has a small shop and can do any type of repair or preventative maintenance on any type or brand of outdoor equipment. 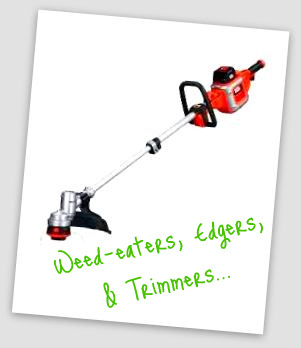 Riding Mowers, Push Mowers, Self propelled mowers, Snowblowers, chipper/shredder/vacs, wood splitters. You name it, we can work on it. ANYTHING WITH A MOTOR!!! 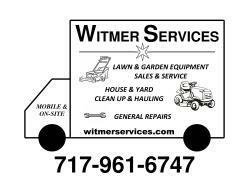 Witmer Services is open 7 DAYS A WEEK, evenings and weekends. Typical hours are M-F after 6PM and all day Sat and Sun. I am ready to get your equipment when you are home from work, or when you are actually using the equipment. Witmer Services doesn't have the overhead of the bigger shops, so we can typically repair at much less than you would pay at a servicing dealer. We can work on anything of any age, from the simplest of repair to major engine overhauls. Can do welding too. 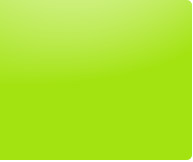 Our rates are very competitive, and can beat most everybody's prices. For example, any push or self-propelled mower, I will pick up and deliver, sharpen blade, change oil, clean air filter and more for less then $50 in most cases. 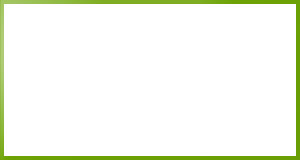 Your distance from the Carlisle Area will affect the final price due to the travel fees. 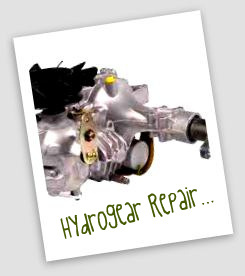 Additional parts and additional repair above and beyond normal routine maintenance will also contribute to final cost. Riding mowers can get the same as above for less than $80 in most cases. Again, your distance from the Carlisle Area will affect the final price due to the travel fees. 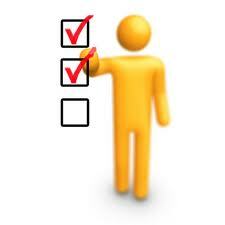 Additional parts and additional repair above and beyond normal routine maintenance will also contribute to final cost. Witmer Services stands behind the work and will come to your assistance as soon as possible if you have trouble with anything that was serviced. 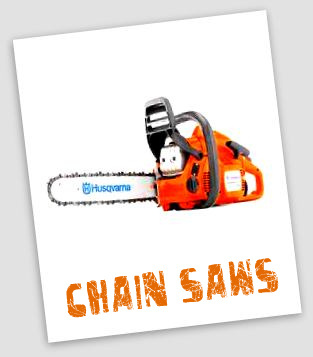 Witmer Services can sharpen most chainsaw chains. $5 - $8 per chain. 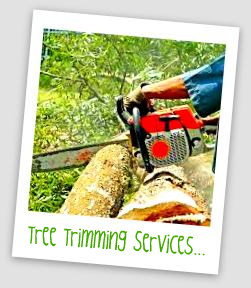 We can also perform repair and maintenance on most any brand of Chainsaw and other 2-cycle equipment. requires you to mix gas and oil. We can work on the high dollar stuff like Echo, Stihl, Jonsered, Shindaiwa, but don't be afraid to have us work on the "cheaper" stuff too like McCullough, Craftsman, Homelite, Poulan etc.... Even if what you have only cost $150 or less for a brand new item - we can typically get equipment running for less than half the cost of replacement - $60 or less in a lot of situations. If you are not sure its worth repairing , a couple quick checks can determine if its economically repairable. buying a new rear in most cases. Standard MTD, Hydrogear, Foote, Dana, Peerless (Tecumseh) to name a few. 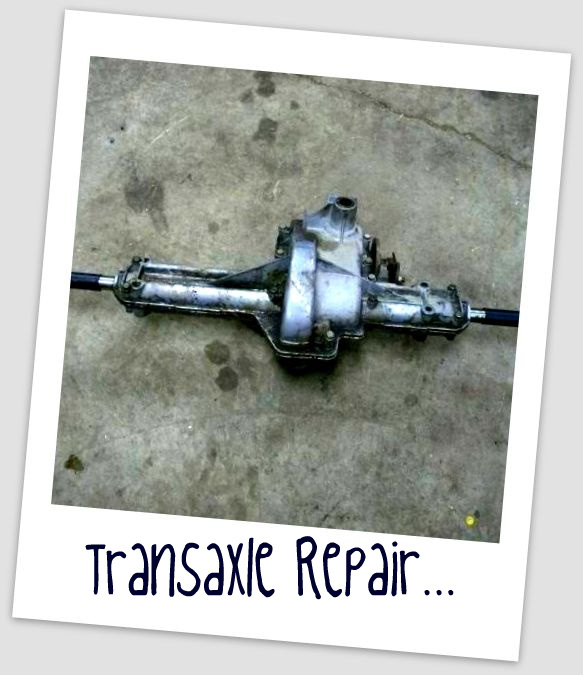 Not all Hydrogear hydrostatic transmissions and trans-axles (rear ends) can be repaired, but we can take a look at it and try to fix it. Replacement rear-ends can be $500-$1000 to replace with new, so have Witmer Services look at it first. Feel free to carry in your malfunctioning rear end or pump, OR have Witmer Services come pick-up your entire mower and have us remove - repair- install. Witmer Services now offers on-site Portable Welding.If something needs welding and its unfeasible to bring to the Witmer Services shop, we can bring the welding to you. Have unwanted lawn and garden equipment lying around your yard or shed and want to get rid of it? Call me. I'll pick it up! Moving? Need to sell your operable equipment fast? Call me. I'll pay cash and pick it up. Cash paid for equipment in fair or gently used condition. Equipment that is in a non-repairable or non-usable condition will require a small hauling fee. Are you in need of used outdoor power equipment? Check out our current on-hand inventory in the On-Hand Inventory section of this web-site. All equipment is serviced and ready to use. Warranties are available on most equipment. I offer light-duty, residential hauling of your household furniture, small appliances, small outdoor equipment, construction supplies / materials, landscaping supplies, etc. 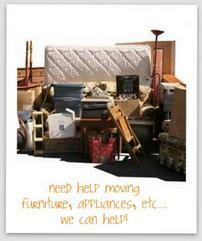 Moving and need a hand moving your household furniture or appliances? Call me. I can haul it for you or be there to give you a hand lifting and moving the heavy stuff! 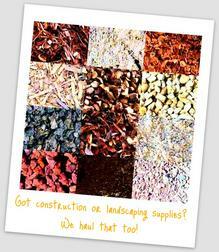 Need to pick up some materials for that home improvement project but don't have a way to get the materials home? I am your guy! Creating a landscaping masterpiece on your property but don't have the means to pick up the mulch, gravel, dirt, shrubs, trees, etc.... I can do that too! Free estimates provided. Quotes available upon request. ​We cannot grind stumps but we can flush-cut close to the ground. 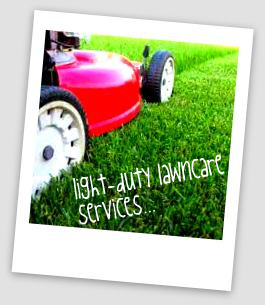 I'll take care of your light-duty lawncare needs. 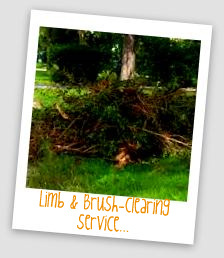 This includes residential mowing, trimming / edging, hedge trimming, mulching, tree trimming, leaf control and more. No contracts required.